J.H. Bouwman, K-J. Conze, C. Göcking & R. Ketelaar. Introduction. J.H. Bouwman, K-J. Conze & R. Ketelaar. 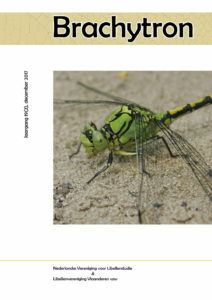 The organisation of dragonfly research in The Netherlands and North Rhine-Westphalia . C. Göcking, T. Hübner & K. Röhr. Status and conservation of Coenagrion mercuriale in North Rhine-Westphalia. D. Groenendijk & J.H. Bouwman. Occurrence and conservation of Somatochlora arctica in the Netherlands. H.H. de Vries. Species Protection Plan for Aeshna viridis. M. Olthoff. The dragonflies of the peat bogs and heathlands in Western Münsterland (Westphalia, Germany). R. Ketelaar. Recovery and further protection of rheophilic Odonata in the Netherlands and North Rhine-Westphalia. M. Aletsee. Classification of dystrophic ponds by means of the TWINSPAN algorithm for an ecological characterisation of the Odonata habitats in the Hohe Venn /Hautes Fagnes. K-J. Conze & J.H. Bouwman. Working with the Habitats Directive: two countries, two approaches.